Metrorail will stay open an extra hour to help riders get home from the Washington Redskins' preseason game at FedEx Field. 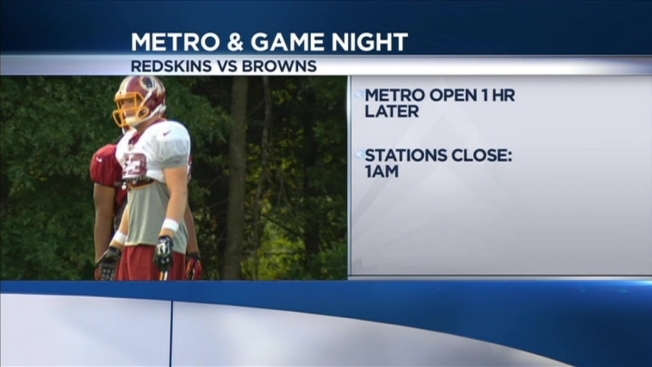 Metro says event organizers will pay for an extra hour of service Monday when the Redskins play the Cleveland Browns. The game begins at 8 p.m.
Metro says riders should use the Largo Town Center or Morgan Boulevard stations near the field when leaving the game. Metro says the entrances at other Metro stations will close at their normal times, but riders will be able to exit all stations during the additional hour of service. Metro normally closes at midnight on Mondays.